What the Hoot? A new mini comic! Hey guys! 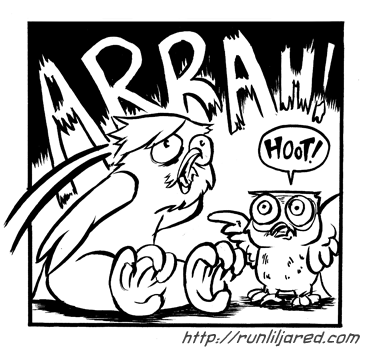 I’m happy to announce that I will indeed have that owl mini comic I was working on the past few weeks. It’s going to be called What the Hoot? I will be premiering it at this year’s SPX in Bethesda Maryland! I’ll be at table I7 so please do stop by! For now here is a little panel from the comic!